Wow, what a boring topic: hiking socks. Hiking For Her heartily (but politely) disagrees. Socks are one of the fundamentals of hiking. If you asked me to list the most important gear a hiker must get right on every hike, guess where they would be on that list? Number one, right along with hiking footwear. Socks and boots - that's TWO items on the list. Nope, not the way a seasoned hiker thinks of it. Ready for all the details on how a veteran hiker chooses the best hiking socks? Hiking socks can make or break your ability to reach your destination. Your feet are one of your most precious assets as a hiker. They bear your weight, your pack's weight, sometimes the weight of your child or puppy or a really cool rock you found or your trail buddy's extra weight from an ill fitting pack... you get the idea. To thank your feet for their endless duty on the trail, you must provide them with fantastically fitted boots. Notice the word "hiking" in front of the socks. You need socks that can stand up to the friction, heat, stress, and swollen feet generated by a hike. Your $1 bargain bin special won't cut it. Or will cut it for just long enough to usher you into the wonderful world of blisters. You are about to enter the wonderful universe of how to choose hiking socks. The basic fact is this: you need two pairs. And they need to be two different types. You need an inner and an outer pair. Sock liners, they're called.Or just "liners". Put these on first, because they have lots of responsibilities. They need to conform to the contours of your foot without sliding around. They must wick your sweat away from your skin, to prevent your epidermis from losing contact with your dermis (OUCH - a blister!). These are probably what you think about when you hear "hiking socks". They are a bit thicker, and a lot sturdier, than every day socks you would wear to work or school or for a workout. These socks for hikers come in all sorts of colors and varieties, which makes sock shopping lots of fun. and will they not wear out after a few trips? Not a bad bottom line, but believe me, many, and I mean many, sock brands fail this simple test. You would do well to avoid them if you plan to hike in all seasons, for many reasons. What about the right fabric? What about the sock materials? Nylon and spandex will ensure a well fitted shape. Merino wool has good moisture wicking properties. Polyester is sometimes blended in to enhance thermal regulation. You have lots of options for sock fit. So for your first pair of socks, pick a pair that feels nice on your skin, in case you violate my "liners first" rule. Have I convinced you that you need socks that are specific to hiking? In case you are coming here out of despair created by ill fitting socks, prepare to let go of your despondent mood! I'm about to name names. 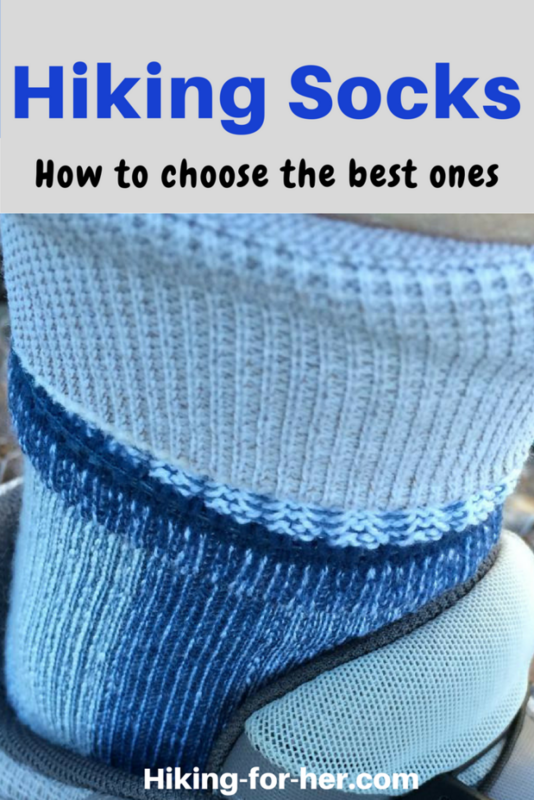 To achieve the ideal condition of liner socks playing nicely with outer socks, and both pairs playing nicely with your hiking footwear, you have to shop around a little. And ask your hiking buddies. And borrow some socks from your significant other or room mate. I'm not kidding! I take sock picking very seriously, and you should, too. I am a loyal fan of the brands which have served me well over the years. I humbly offer them as a place to start, if you don't have any sock lending buddies to turn to for advice. 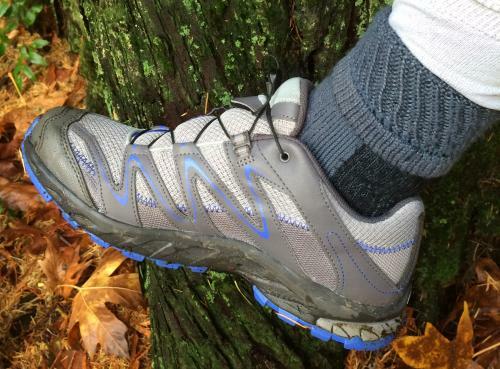 For a well built technical outer pair of hiking socks, try Thorlo, Smart Wool, and Darn Tough. Lightweight Thorlos are also a good choice for moderate day hiking on good trails. Here's a HFH review of light hikers. For a review I did of SmartWool medium weight women's crew hiking socks, read this. Darn Tough Merino wool socks are another great choice. They have a lifetime guarantee for performance and fit. Check out this pair of micro crew socks recommended for hikers. If two pairs of socks seems like too much bulk, please try the combo at least once on a long hike. Then you'll have the data to make a decision: one pair, or two. If you always wear lightweight hiking shoes, and stick to well maintained trails, maybe one pair is the way to go. But if you have any inkling of a blister forming, try two! Be careful here - you want to pick the right type for your style of hiking. Socks designed for hikers will be labelled to indicate how much wear and tear they will stand up to, and how much cushioning to expect. Look for the tell tale words "light" or "heavy" or "expedition". Personally, I choose the "trekking" variety of socks because they're built to take what I dish out inside my boots. And even so, I replace my socks every other summer because the heels and toes wear out. And my apologies in advance for sticker shock. Your feet qualify as your most important hiking gear. I beg you, skimp somewhere else if you have to, but never on your feet! Here's something a bit different: alpaca fiber socks. I love 'em for their softness and trail performance, and because alpacas are so very cute. Read my Armaskin liner sock review. And the Injinji toe sock review. And here's a new brand to try: Root Republic. Did you have any idea that exploring the wonderful world of socks for hikers could be so much fun? Now that you have the right socks, turn your attention to the best hiking boots!